In 1995, a quinquennial survey highlighted many problems with the fabric of the building. In addition to re-thatching, it identified the need for urgent repairs to external stone work, windows and the timber-clad belfry. Following consultation with English Heritage and the Diocesan Advisory Committee, specifications were prepared and competitive tenders sought. Work on site started in early July 1999 and was completed in mid December 1999. Conservation of the building closely followed the philosophy of the original architect, William Lethaby, one of the leading lights of the Arts and Crafts Movement. 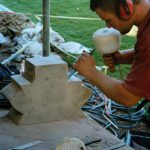 Like their illustrious predecessor, the modern architects, Hook Mason, took a hands-on approach wherever possible, regularly consulting with the many craftspeople working on the restoration. Careful research into the original design and detailing, using contemporary plans, drawings and photographs, allowed the conservation work to stay close to Lethaby’s design, making only minor changes where absolutely necessary. 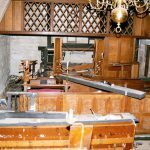 The restoration work also afforded an opportunity to make-good some of the unsympathetic repairs which had been carried out in the past. 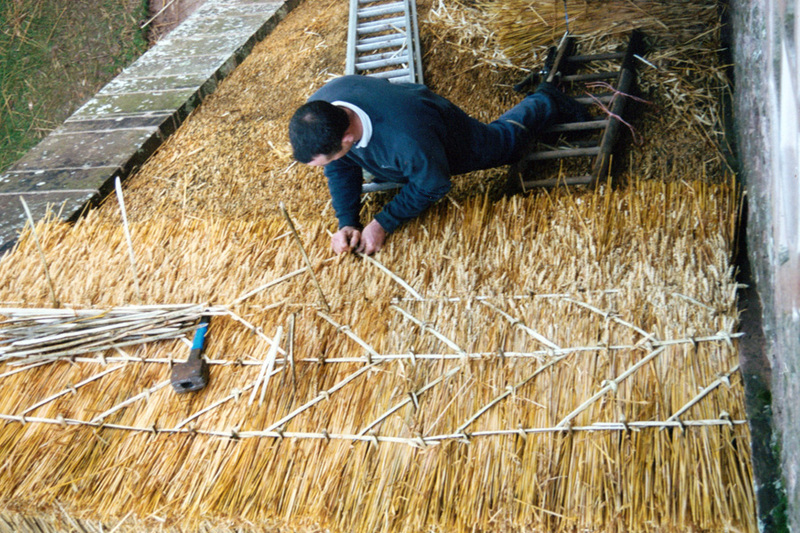 Perhaps the most interesting element of the work was the re-thatching. 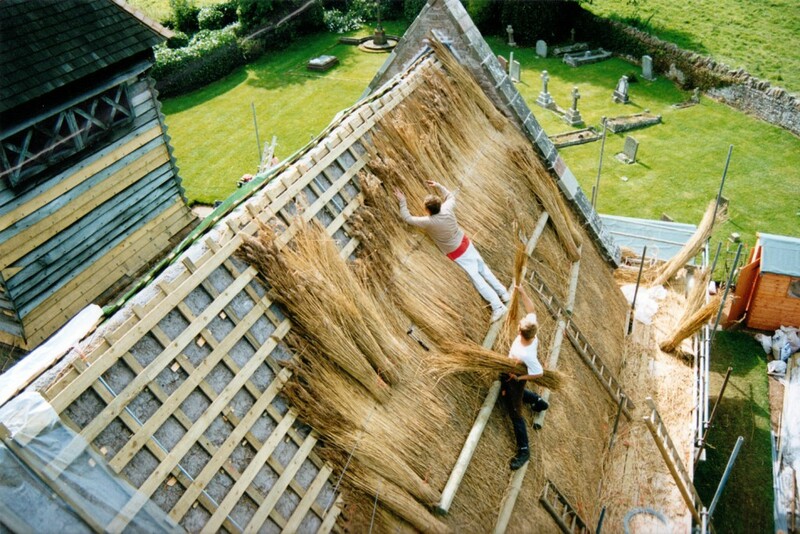 Removal of the old thatch revealed an untidy and undulating but nevertheless, very sound concrete roof. 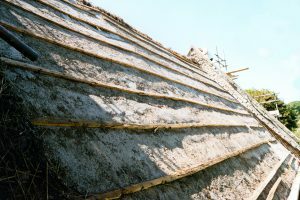 It is well known that the roof contains no reinforcement, and it was interesting to see, after almost one hundred years, no defects whatsoever. 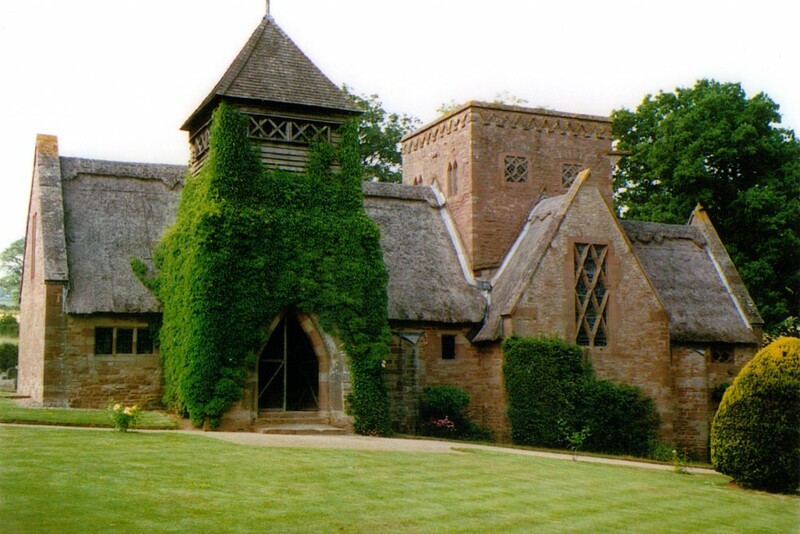 The church had been re-thatched once previously but the original details had not been followed. There were a mass of unsightly lead flashings over the parapets and at abutments, which were all removed, except where absolutely necessary. 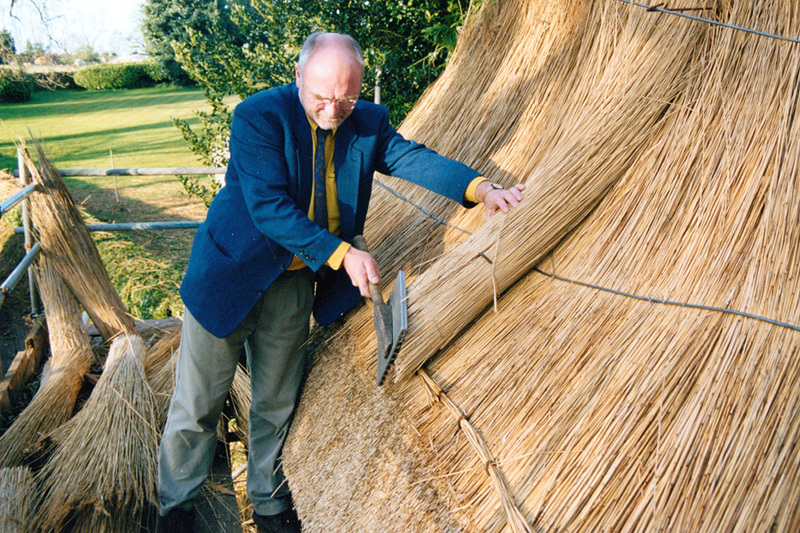 The new thatch is predominantly Norfolk Reed and is secured with stainless steel fixings. 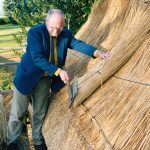 At all wall and parapet junctions concealed lead gutters have been provided beneath the thatch so that water will be able to escape in the unlikely event of it passing through the full 300mm thickness of thatch. With the aid of the original photographs, Lethaby’s original coatwork design for the chancel and his ridging details were recreated, the latter in wheat straw secured with hazel spars. This new roof is expected to have a further life span of fifty years. The ridges will have to be replaced every twelve years or so. 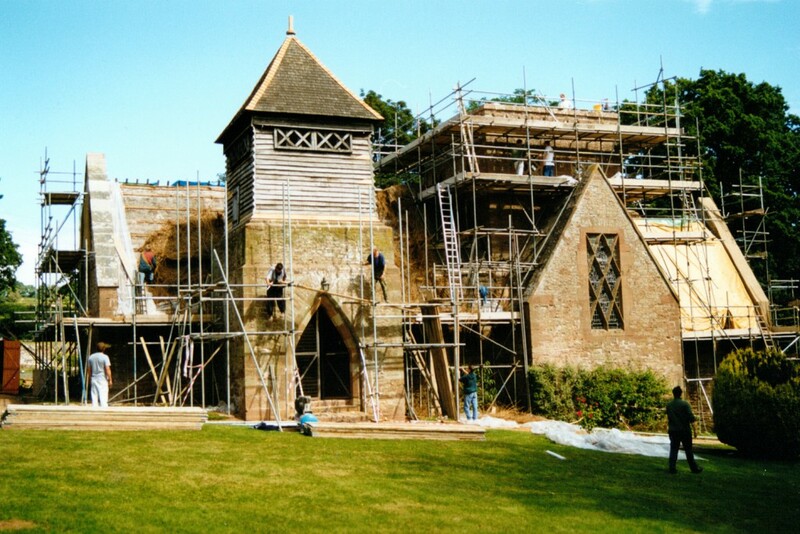 Whilst scaffolding was in place the opportunity was taken to replace all of the badly eroded stonework. The original chancel cross and the belfry finial were replicated using old photographs. A number of areas of cement mortar were removed and repointed with lime mortar. 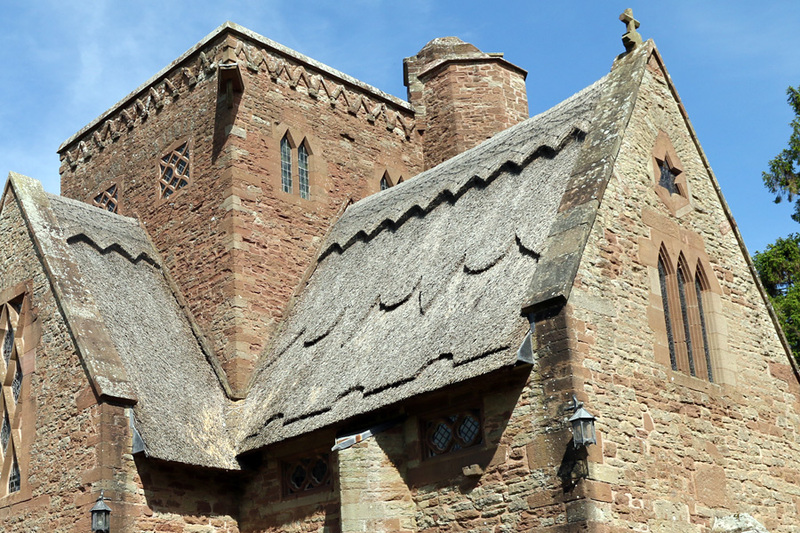 New lead caps were provided to the triangular strip buttresses and to the vestry staircase roof. Windows were very carefully overhauled and discreet ventilation and drainage provided in the crossing tower. The original oak framed belfry had never been re-boarded but the oak boards were in a poor state of repair and nails were rusting. Very careful on-site repairs were carried out and a few replacement boards secured with traditional blacksmith made nails. 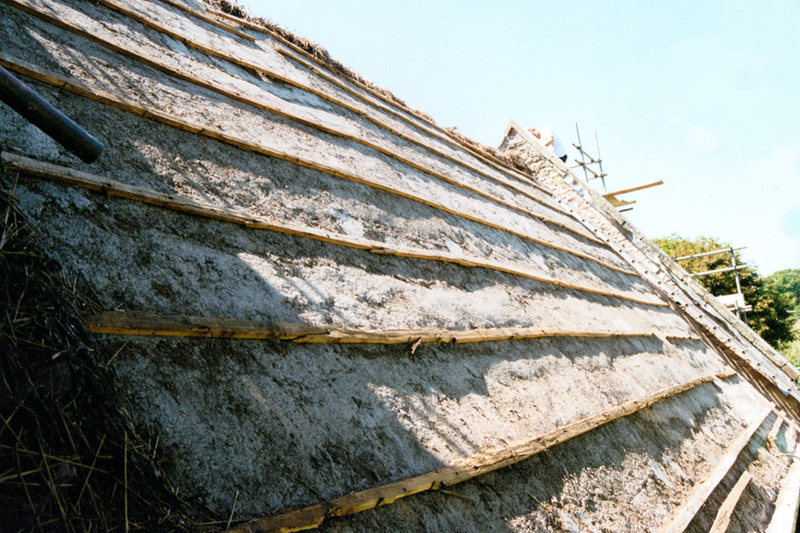 Within a matter of months following completion of the repairs nature had done its job and it was impossible to see which timbers had been replaced. The lych gate and boundaries were very carefully repaired and a new kissing gate provided exactly to replicate the original, which had been replaced in recent years with stained softwood. A new underground drainage system was installed. The excavations for this revealed the massive concrete foundations which Lethaby provided to the east wall of the south transept in order to prevent structural movement; almost certainly a sledge hammer to crack a nut! Internally the first phase of electrical re-wiring was carried out and the ugly conduit, which was originally installed in 1947 when electricity first came to the village, was removed. After much careful research and experimentation a new internal lighting system was also installed. A number of lime plaster repairs were carried out and the interior was lime washed once again. 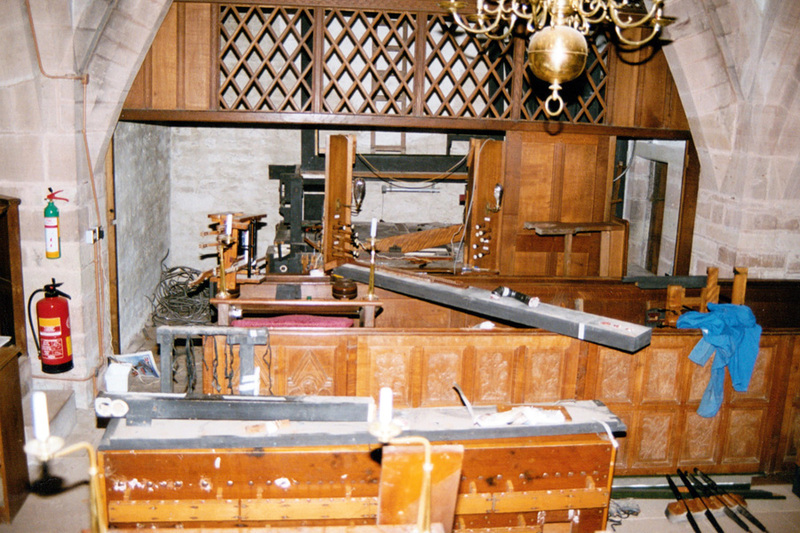 As part of the conservation work the original J W Walker & Son organ was restored. This was carried out by the same firm who are still in business. The original cost was £512, the restoration cost £58,613.70! The parish was also fortunate in that a new ‘all seasons’ altar frontal and choir stall falls were anonomously donated. 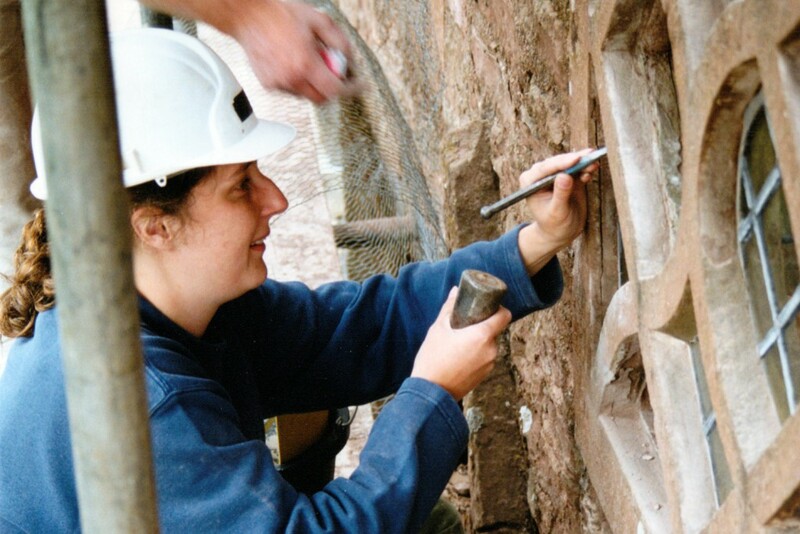 The work was carried out by the Sarum Group from Salisbury. Further interesting work is continuing here. Negotiations are taking place with the Diocesan Advisory Committee to provide a suitable ramped access for disabled persons. A survey of the churchyard flowers is being carried out and the PCC hope to be able to produce a publication to compare with the many flowers illustrated within the church. In this age of modern technology it is heartening to know that many arts and crafts are still flourishing. 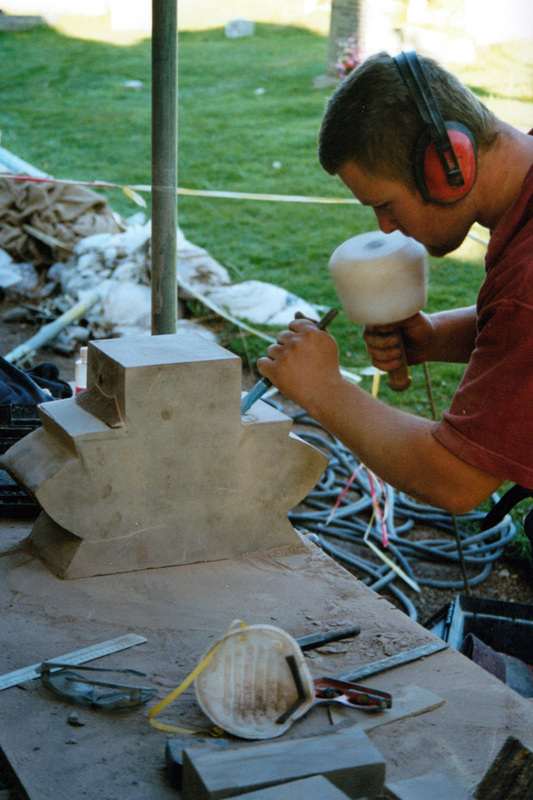 As in Lethaby’s time, many fine local craftspeople were employed in restoring All Saints’ church and, wherever possible, his Arts and Crafts methods and philosophy were followed. Unlike Lethaby, our modern architect has been paid! 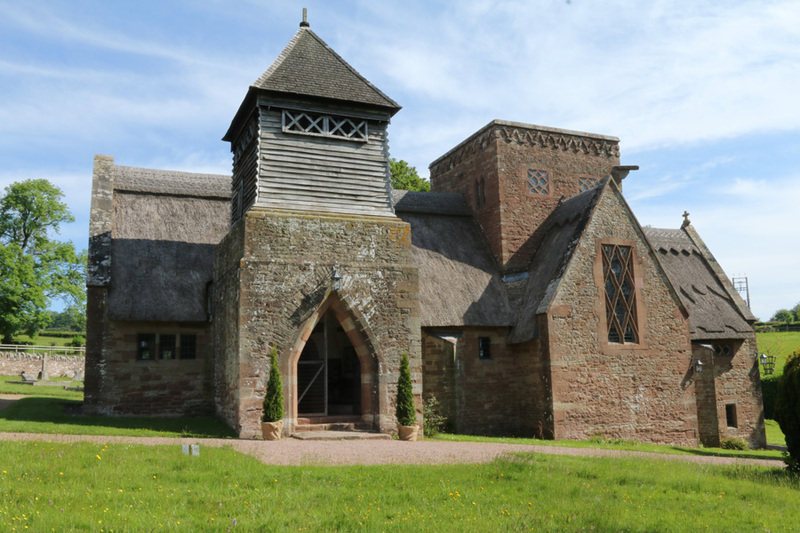 The parish of Brockhampton are indebted to English Heritage, the Dean and Chapter of Hereford and in particular the Clay family, who are Mrs Fosters direct descendants and have provided generous financial support.